Sure, you can carb-count over cocktails at the next party you attend. Or you can bring a knock-out appetizer of your own, impress everyone with your culinary genius, and know for certain the exact carb count of at least one very blood-sugar-friendly finger food on the buffet table. 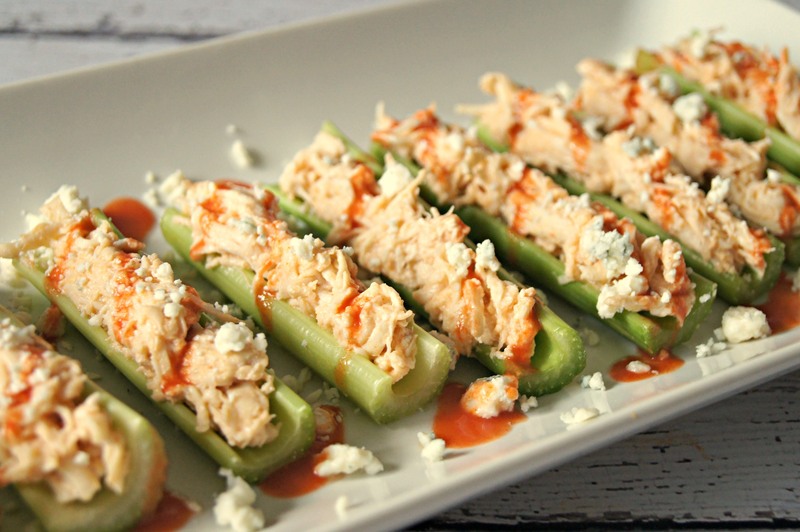 Crockpot Buffalo Chicken Celery Sticks are the perfect low-carb appetizer to bring to a party: Not only are they easy on blood sugar, but they’re bite-size (read: easy to carb count), full of delicious flavor, and require only a few ingredients. Greek yogurt neutralizes the heat of the hot sauce, making the flavor kid-friendly, too. You can start cooking the chicken in the crockpot the morning before a party and quickly fill the celery sticks just before heading out the door. It doesn’t get much easier than that! Kids LOVE this fun take on what’s typically thought of as a more grown-up food. And at just 1 carb gram per roll, they can indulge in a few. If you happen to have kids, and your kids happen to have type 1 diabetes, there’s a decent chance you’ve got cheese sticks in the house (just a guess). Only two more ingredients and you’re on your way to these mouthwatering Cheesy Bacon-Wrapped Pineapple Rings. Baking the pineapple brings out its natural sweetness even more, and combining it with salty, crispy bacon puts it over the top.